Combine organic, raw honey with powdered Ceylon cinnamon, and you have a back to basics, yet effective, home treatment for preventing and treating blemishes and improve the complexion. 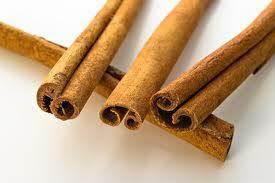 Cinnamon can benefit the skin because it contains antibacterial, anti-fungal and antioxidant properties. By drying the skin and bringing blood and oxygen to the outer skin surface, cinnamon can help get rid of unsightly pimples. Actually, this blend can also be part of the treatment for wound care. By applying to the affected area, the cinnamon kills germs and the raw honey acts as a form of antiseptic. Let the bees help you maintain a beautiful complexion, deter blackheads, ease the frustration of troubled skin. Wildflower and clover honey already have the beneficial attributes of these herbs within the honey itself. Honey is a natural humectant which means it retains moisture and plumps up skin cells. It helps to rebuild the moisture level in the skin without making it oily. The high sugar, low protein content create an acidic environment with limited availability of water therefore bacteria cannot thrive. 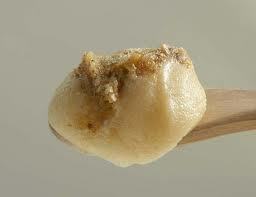 When you wash the honey off your skin, a small amount remains in the pores. As a result, the sugars in the honey attract water from the air, which keeps your skin hydrated. Raw honey has a different look than pasteurized commercial honey. It has not been heated or filtered therefore it looks a bit cloudy and has flecks of the activities of the hive, such as honeycomb bits and pollen. Having a high anti-oxidant level and being the natural enzymes have not been destroyed by heat, raw honey is a much healthier product. The raw honey used is a thick, creamed honey which is nice in that it won't drip down your face as readily as will regular honey. "We strain the honey at extraction through a screen to get any foreign particles out (bee wings, legs etc). We do not filter through a cheesecloth at bottling. Crystallization has to due to the moisture content, forage type and temperature warmed to bottle. We warm on average to 100 degrees for a short while to be able to bottle." Glucose oxidase is an enzyme that when combined with water produces hydrogen peroxide, a mild antiseptic. Honey also contains antioxidants and flavonoids that may function as antibacterial agents. It calms down troubled skin without irritation. These antiseptic properties help prevent the growth of microorganisms that cause blackheads. Trying to control blemished skin by washing too frequently with soap can backfire resulting in dry irritated skin while further increasing the production of oil. Some acne treatments are just too harsh and drying. 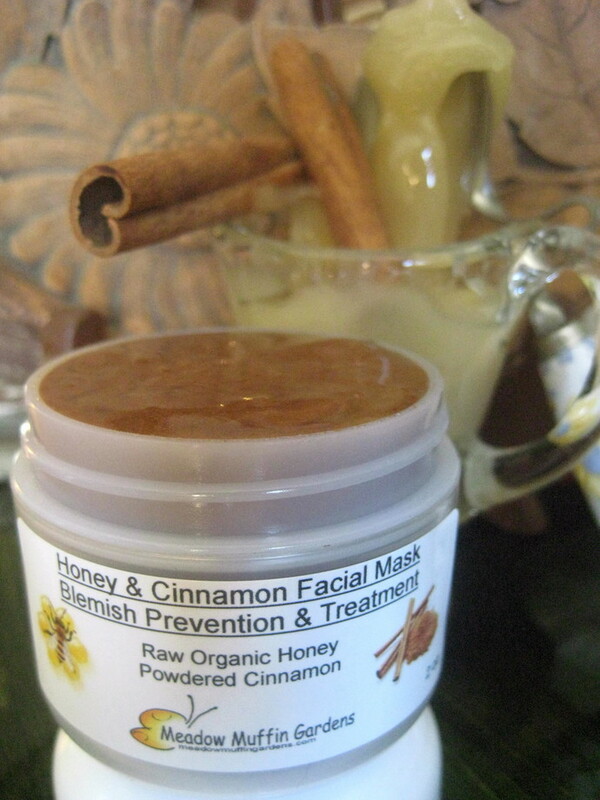 There are a few other honey masks available that utilize the strength of essential oils in the fight against pimples. One uses tea tree oil and chamomile essential oils and the second uses lavender. This listing using cinnamon just offers further options, since there are those who perhaps don't like the smell of tea tree oil or who have an allergy to chamomile or lavender. Ideally, if you have oily skin and/or clogged pores, you should begin this treatment with a facial steam to open up your pores which will enable the masque to penetrate more deeply. You do that by bringing about two cups of water to a boil and adding that to a bowl (add a tea bag if you'd like (black tea or chamomile is good). Be sure to have a clean, washed face. Then cover your head with a towel and lean over the bowl to trap the steam. Relax for about 10 minutes. Please do a patch test on a small area before using all over your face to observe for signs of sensitivity or an allergic reaction to honey. Apply a thin film onto your face and neck and relax for 15 to 30 minutes. Avoid getting the mask too close to your eyes. You will notice a tingling feeling as the cinnamon stimulates your skin. Wash off with warm water and moisturize if necessary. Cinnamon masks may irritate the skin, so observe how your own skin reacts and adjust the amount of time you choose to leave it on your face. It is not recommended that you use a cinnamon mask all over your face more than once a week. Spot treating as described below is probably alright to use as needed. Another way to use a honey mask is to spot treat blemishes. Before going to bed, dab a bit on the blemish and leave on while you sleep. Optional is to cover the spot with a band-aid to avoid sticky honey getting on your sheets. Honey naturally crystallizes with time, which is normal, especially with raw honey which hasn't been heated and processed. You can then use as you would a sugar scrub, by applying a bit to finger tips or facial cloth and use gentle circular motions to cleanse. If you don't like the crystals, just microwave for a few seconds or gently heat in a warm water bath. ***If you do decide to microwave your honey due to it being too thick to spread nicely or if it crystallizes, just remember not to let it get too hot. It is said that honey shouldn't be heated hotter than it would naturally get in the hive, so don't let it get hotter than about 95 degrees F. Any hotter starts to destroy the beneficial enzymes. So think of a mom who tests the temperature of the baby formula on her arm to make sure its not too hot and that is about body temperature, warm but not hot. The cause of acne is not the same for everyone. If your breakouts are brought on by bacteria, then the use of honey to combat those blemishes will in all likelihood help, but if your blemishes are triggered by medication or unhealthy lifestyle, any topical product may not be able to get rid of problem skin for good. Cinnamon can be irritating to sensitive skin, therefore if you suffer from a skin condition, be sure to do a patch test in a small area before applying this mask all over your face. Do not use honey and cinnamon masks on the tender, sensitive skin of children. Check with physician before self-treatment if there are any doubts on proper care based on the situation. Meadow Muffin Gardens is the result of a passion to recognize the abundance of natural gifts provided to us by our Creator. Our desire is to utilize the healing power of plants and encourage people to educate themselves towards a greener footprint in their lives. We supply an alternative choice for personal care products. We are not intending to treat or cure any particular condition. As with any herbal remedy, information and formulas have not been regulated by the FDA. Herbal lore has been trusted and handed down through the years but it is within your discretion how you use this information in treating a condition. Meadow Muffin Gardens does not take responsibility for your use of these products. Ingredients are listed so you as the consumer can use your own discretion as to which herbs, oils and essential oils may be beneficial to your needs.